We are well versed manufacturer, supplier and exporter of Dry Chemical Powder. 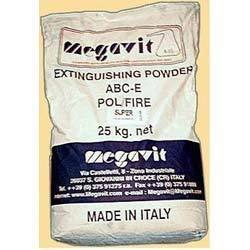 We are offering quality range products of megavit dry chemical powder, dry chemical powder, dcp for fire extinguishers, monnex powder and metal fires powder. 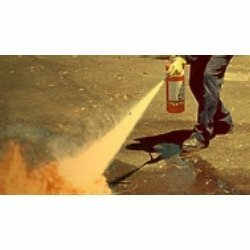 We are reckoned as reputed manufacturers, suppliers, and exporters of a wide spectrum of Dry Chemical Powder such as Fire Extinguisher Powder with ISI mark and UL listed. It is effective in class A (ABC Type), B, and C fires. It is free flowing, non hygroscopic, and moisture resistant. It has outstanding compatibility with foam and other dry chemical powders. It is ideal for hand portable and wheeled extinguishers, large stationary units, mobile units, and various fixed nozzle piped systems. Our company is one of the prominent processors and suppliers of Megavit Dry Chemical Powder. This is fire extinguishing chemical used to prevent fire accidents in the manufacturing, supply and logistic centers. Our fire retardant products are formulated as per the EN 615 and ISO 7202 quality specifications. Dry chemical powders are generally used in various industries such as Food processing, Cosmetics, Water treatment plants and others. Our chemicals are widely acknowledged for the features like free flowing, moisture resistant, non toxic, non hygroscopic and non abrasive.